Playa Hermosa, an exotic beach located at the Central Pacific of Costa Rica, is the one of the favorite places for surfers. But what about Yoga lovers? Vida Asana Yoga Retreat Center is there for you. This special place with unique environment is a perfect destination for physical, mental and spiritual well-being. 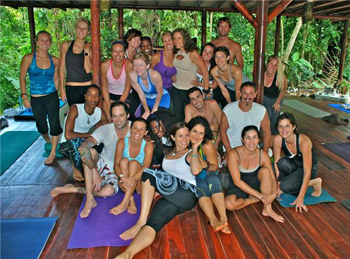 While staying 7 nights at Vida Asana you will enjoy unlimited Yoga Classes. They will arrange a tour to waterfalls. You will enjoy yourself in organic garden and attend healing arts workshop. While staying 7 Nights at Vida Asana you will have 3 healthy meals a day, can attend unlimited Yoga classes. They will arrange a tour to a waterfall. You will attend one hour organic garden workshop or healing arts. Price for this excellent package is only $870. Now let’s focus on accommodations. It’s just like a home away from home,a perfect place for close friends and/or family. This duplex house has a well furnished kitchen,AC and ceiling fans. Extra Large and Comfortable rooms with Ceiling Fans will make your days unforgettably awesome! You will enjoy Private Bath with Hot Water and Small Kitchenettes. Air-conditioned rooms will ensure your comfort.